Rainy Day Thoughts: he's a bear-shifter-- who knew! Oregon writer, Rain Trueax, and Oregon painter, Diane, co-author Rainy Day Thought, where they write about ideas and creativity. Diane posts on Wednesdays and Rain on Saturdays. There may be extra days or changes as situations warrant. Comments, relating to the topic, are welcome as it turns an article into a discussion, but must be in English and not include profanity or threats. he's a bear-shifter-- who knew! My writing has been broken up by life-- which has a way of happening. I am trying to get back into it as the characters take on more flesh. I learn things about them that I might've felt but did not know in the beginning-- which has a way of happening. In the case of my hero for Something Waits, I did not originally know he was a bear-shifter. It came to me as I recognized the conflicts he faced coming from two ethnicities-- adding to it the family secrets which must not be spoken. Below is a snippet of one aspect of his life that has impacted who he is in ways most of us will never experience or believe because we know what the 'real' world is... Because this is part of a raw first draft, it might be different in the book-- editing has a way of doing that. Marsh ground his teeth. He felt the kind of anger that never led to good. “I’ll talk to you later,” he said to Jericho, leaving the room and managing to not slam the door. His hotel sat on the edge of the Catalinas with desert around it. Perfect for what he needed. Soon, he’d gone far enough from the buildings to strip out of his clothing and let it happen. The cells in his body transformed their energy and within moments, the process was complete—he no longer appeared as a human but had taken on the form of a large bear. 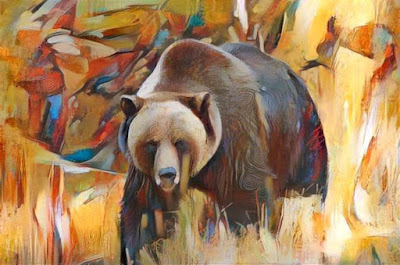 He lunged forward, not needing moonlight to see his way now that he had a bear's vision and senses. The width of the trail was perfect for him to gallop up the trail—his speed increasing the higher he got. Dark as it was, he didn't expect to run into humans on the trail. If he did, he'd know enough ahead to go off trail and wait out their passing. Taking on an animal's form had given him no comfort the first time it’d happened. He’d been ready to graduate from high school, angry at something that he no longer even recalled. That day, with no warning, he'd felt his body morph into that of an animal. He had been fortunate he’d been up on Mt. Lemmon when it happened, hiking, thinking, and trying to work out his future. Being a bear had not been part of it. In confusion and panic, he’d stayed where he was and waited for whatever had happened to go away. Finally, it had. His clothing had been torn, but he’d put on what he could and driven back down the mountain to try and understand. Being half Navajo, Marsh had heard the stories of skinwalkers, humans who turned animals. Some of them had become bears. Skinwalkers were always evil, seeking power from unholy sources. He had not sought power—other than having allowed his anger build to an unhealthy level. The years since found him researching other ways such transformations could happen. Except in the Navajo world, it was always an inborn quality—inherited mostly. Who in his family had been a bear-shifter? He was unwilling to ask, to trust anyone enough to reveal his own secret. He could only try and control it. It had taken years for him to recognize he could use it. It was empowering in a strange sort of way to leave the world of humans and become one with nature, where the scents and sights were so different. Now he used it when he needed to let off energy, when he couldn’t think through what was happening in his human world. He ran for what might’ve been hours. He had to leave time to get back before light. He wanted to be on the mountain. When he reached the first pines, he sat under them and let their energy flow into him. A rabbit approached and then hopped away when it saw him. He could have killed and eaten it, but he’d never developed a taste for raw meat—even as a bear. Bats flew overhead, in the distance he heard an owl. Night creatures, as was he at least for the moment. Was he also evil as his mother’s people would claim? He couldn’t ask his mother. She’d died when he was only thirteen. He knew Grandmother Ali having spent summers helping her with her sheep, learning Navajo ways. During the school year, he’d lived with his father’s mother in Tucson—where he’d met the love of his life. Something he had eventually run from until he no longer could run and had to return. He hadn’t expected her to greet him with open arms. She didn’t understand what had motivated him to leave. He had been unable to tell her then or maybe ever. How could she understand what he didn't. In 1993, we had made our third trip to Montana. In a gallery, I saw this painting, met the artist, Larry Knutson, and photographed a couple of his paintings. I'd have loved to have afforded the work, but the budget wasn't stretching that far. 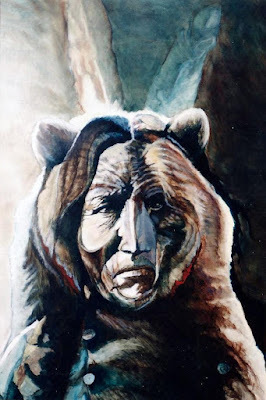 When I knew I was going to have a bear-shifter in my next book, I tried to find where I had the photograph. At that point, I didn't even remember the year. I went through many albums and finally there it was. I believe it says something about this idea of shifting into another shape-- even if in a fantasy way. In looking online to see what he might be doing, this is the only site that had his work-- Art at the Park. There was a quote by him that I liked. "we all have an animal spirit that we associate with in some way... It should not be kept outside of ourselves." Interesting. I came here from FB. I have always been interested in the Navaho and the ancient Indian cultures of Arizona. Wish I could still Snowbird down there. Love stories, with elements of suspense and emotional issues, where the hero and heroine are challenged with sometimes life-threatening problems at a time when they are falling in love. from cities to western settings and finally some paranormals. I was given a copy of this book. However, that did not affect my opinions. In the tradition of Fireproof, this is a compelling story about the power of unconditional love in the face of trauma and fear. While the best category for it is romantic thriller, it's so much more than just an afternoon's entertainment. There are heart-stopping moments, to be sure, and tender (NOT graphic) interludes between Susan and her soon to be ex-husband, Dane. But the core of the story is the impact of a traumatic childhood on adults. I applaud Ms. Trueax for not making this process too simple or the problems too easily fixed, for showing the aftermath of agony, despair, and self-loathing. Both characters have their flaws and both make mistakes, but at the end of the day, they love each other, and that commitment is solidified in the face of danger. If you are looking for a book that is action-packed, entertaining, tender, and not afraid to face gritty issues head-on, you don't want to miss this one. Four sisters and their mother work to keep Tucson safe against those who would gain power at the expense of others. Paranormal romances. Heading west on the Oregon Trail, to the settling of Oregon, to the aftermath of the Civil War, the series follows the Stevens women as they find love and then must fight to keep it. From 1883 to 1906, these stories follow families and friends, as Arizona Territory struggles to become civilized enough to earn statehood (which won't happen until 1912-- with some of the states still unsure about allowing in this wild and woolly territory). Just a Little Green (For Earth Day) - This year, I am letting the forest and trees speak for themselves. Wordless Monday - The famous north rose window at Notre Dame in Paris, from our trip last summer. Heartbreaking. This blog is a participant in the Amazon Services LLC Associates Program, an affiliate advertising program designed to provide a means for blog owners to earn fees by linking to Amazon.com and affiliated sites. This costs the user nothing but gives them a short term cookie which lasts a day. This blog collects no information on the ones who comment here. It is a participant in the Amazon Services LLC Associates Program, an affiliate advertising program designed to provide a means for blog owners to earn fees by linking to Amazon.com and affiliated sites. This costs the user nothing but gives them a short term cookie which lasts a day.